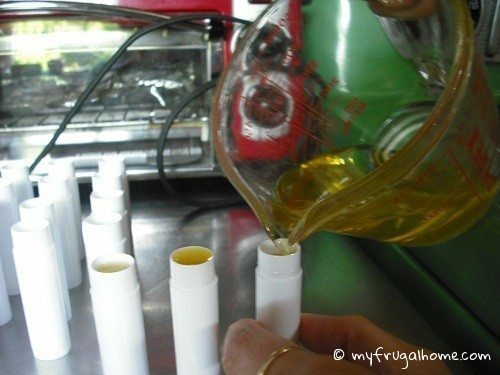 Make a batch of lip balm, and you’ll wonder why you were ever willing to pay $2-3 for a tube. Seriously, lip balm is just too cheap and easy to make to hand over that kind of cash for it. Follow this recipe, and you’ll have 17 tubes (give or take) in less than 15 minutes time. Step 1: Measure out one part beeswax, two parts solid oil and three parts liquid oil. 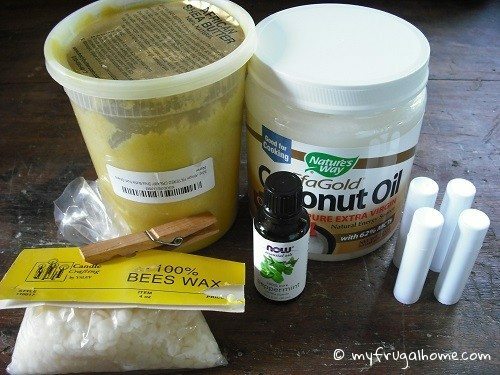 I used one tablespoon of beeswax, two tablespoons of Shea butter and three tablespoons of coconut oil for this batch (enough to make approximately 17 tubes). Step 2: Heat the three ingredients in a double boiler, until melted (a Pyrex measuring cup in a pot of boiling water works perfectly for this). Do not leave the stove unattended. 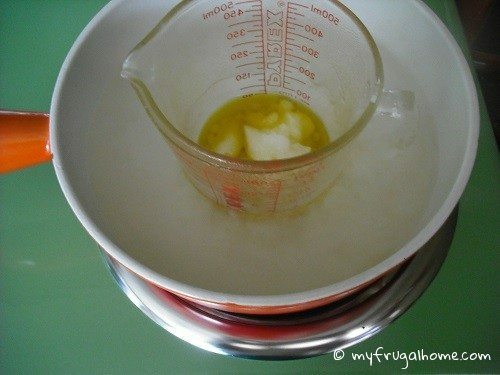 Step 3: Add several drops of essential oil, and stir to combine. I added peppermint oil to mine. Step 4: Pour the mixture into your containers. Let them sit for a minute. Then, top them off (the balm will shrink a bit as it cools). Step 5: Allow your lip balm to cool and harden. Then, it’s ready to use. It’ll be a bit soft the first day, but will continue to harden over the next few days. 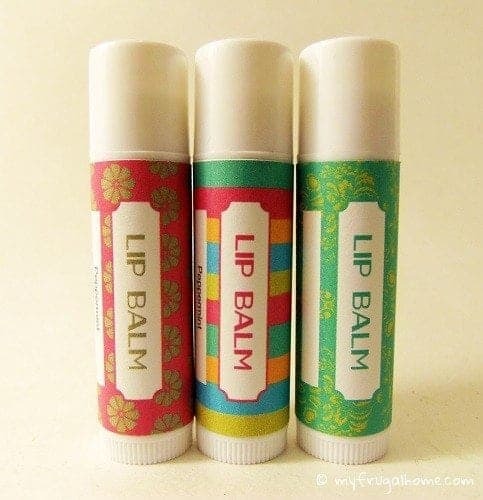 Step 6: Print labels for your lip balm, and enjoy! These labels are designed to print on full-sheet shipping label paper. Use Avery 8165 for inkjets; use Avery 5265 for laser printers. 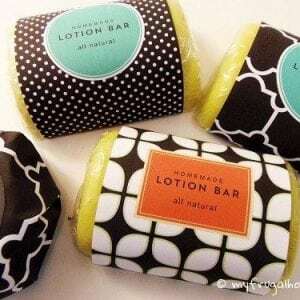 The labels include a field that you can customize with a name for your lip balm or anything else you’d like to add. I am excited to make these as Christmas gifts! Thank-you for the tutorial..I have one question…what did you print the labels on? Just paper then tape them to tubes? I printed them on full sheet label paper (so they were like stickers). You could definitely print them on regular paper and tape them, though. 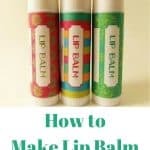 Wanted to find out what size stickers you used for the lip balm labels? Hi Kimi, I printed my labels on full-sheet mailing labels (8.5″x11″). Then, I just cut out the individual labels. Just as a note, shea butter should always be added last and off heat. the heat can cause the shea to become grainy. I am going to try this with 24 kids. I’m thinking about using a hot plate & pot instead of a microwave, so I can demonstrate. How long does it take the lip balm to cool & harden? Will 1-1pound bag of wax be enough?What is the suggested ratio of ingredients? A hot plate would work (just be sure to keep the double boiler set up for safety). A crockpot is another option. 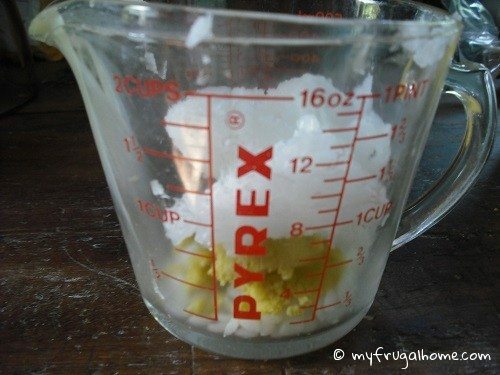 You could just stick the ingredients right in the crock. I have one from a thrift store that I’ve designated for craft use. You could probably use a crockpot liner, if you want to use your regular crockpot. The wax actually hardens pretty quickly. It will have solidified enough for the kids to take them with them after the demo, even if they haven’t finished hardening. I just wouldn’t twist the lip balm up for a couple hours. To make sure you have the right amount of ingredients, just look at how many ounces each lip balm container holds, and multiply that by 24. 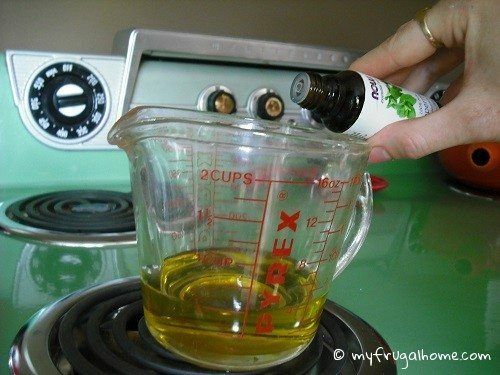 The recipe uses one part beeswax, two parts solid oil and three parts liquid oil, so divide your total ounces to reflect that ratio, and you’ll know how much of each to buy. What size labels did you use. Would you have the number (or at least size and name) of an Avery product by chance? I used full-sheet labels for these. They’re often sold as “shipping labels.” If you have an ink jet printer, something like Avery 8165 would work. I’ve found Walmart to be the cheapest place for label paper (much as I dislike shopping there). Hello! I am curious, what program did you use to make these fun labels?! 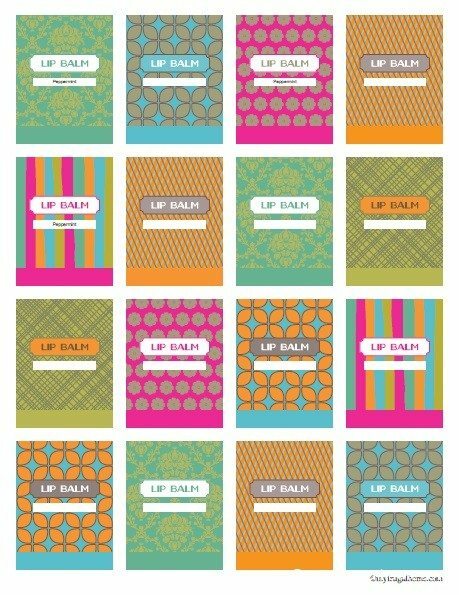 I would love to recreate fun labels like these and customize them to the flavor, or gender I’m making the balm for. They were made in InDesign (prepare for sticker shock).